So, I don't have a lot of time to do the research that I'd like to do on some of these stories of black history, but I'm enjoying this. I'm learning a lot about North Carolina's history. Next year, maybe I'll get a two month head start on this project. Tonight I want to highlight the Roanoke Island Freemen's Colony. The Island itself seems to be the focus of really bad things happening. It was the site of where Sir Walter Raleigh dropped off a group of 150 English settlers in 1587. Those colonists would never be heard from again. When Sir Walter Raleigh returned three years later they had vanished. No signs were left behind that they had even been there. Author lee miller wrote a book on that incident revealing that the group may have been sabotaged or massacred by unfriendly native Americans. 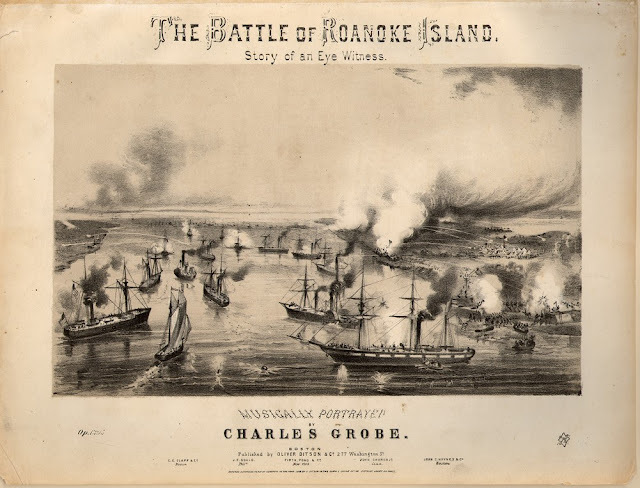 In 1862, Roanoke Island became a Civil War battlefield. 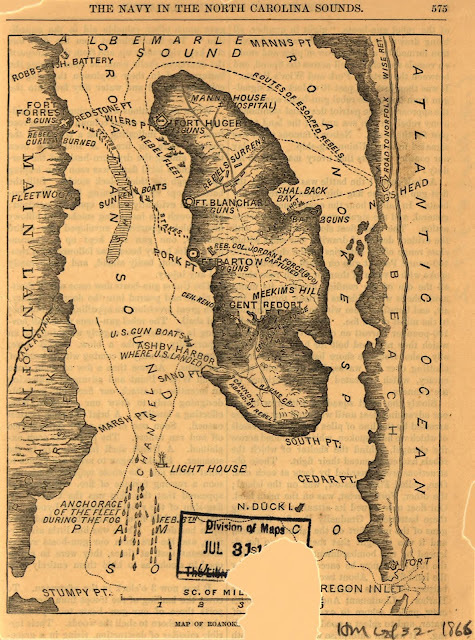 Union Soldiers prevailed despite the challenges they faced on they island with a well guarded fort and rough terrain. After the fall of Fort Raleigh slaves began to make their way there… From 1862 to 1867 it was home to more than 3,000 former slaves. The Freedmen’s colony is an Historic National Underground Railroad site. But in some regards the life that they found on this island was not the free paradise that they may have been seeking for their families. Even worse, in many cases they were given land that was taken back at the end of the war and returned to its previous owners. This is another site that will be on my list of places to visit around North Carolina in the next year or so. Gregory P. Downs is an associate professor at the City College of New York wrote about the Freedmen’s colony in the New York Times in an article titled “Lost, Again” Here is how he put it. "At first, the island’s slave population actually decreased, as many of the 200 slaves on the island chose to return to their families across the sound. But even as Burnside promised white residents of the island that he would not “destroy your freedom, demolish your property, liberate your slaves” or “injure your women,” the Union began to take in runaway slaves from Confederate-controlled areas and settle them there. A “party of fifteen or twenty of these loyal blacks, men, women and children, arrived on a ‘Dingy,’ ” one officer said later. Slaves arrived from the mainland in larger and larger numbers, 100 within the first month, and 250 by early April, spurred by rumors that they would soon be free. Many lived in groups of up to 10 people, cramped in brush and earth huts or under pine boughs. “Scenes of suffering are witnessed there which baffle description,” she wrote. “There are hundreds here ready to perish for lack of clothing, to-night.” In December, after the arrival of boatloads of former slaves, Elizabeth James reported, “I see sights, often, often, that make my heart ache, & which I have no power to relieve.” By the spring of 1864, two-thirds of the island residents lived on government rations. “Here are 3,000 bodies nearly naked, nine-tenths of them are women and children,” another missionary wrote. After the war the government returned the property to the prior white owners, despite freedpeople’s petitions to “remain upon the land.” In other colonies on the Sea Islands or near New Bern, freedpeople remained in the area as squatters or renters, but most of those on Roanoke crossed the sound to the coastal towns and plantations where they had lived before the war. Soon there were only a scattered few freedpeople left on the island. The “African Village” had become the newest Lost Colony of Roanoke.